Are your users getting the mobile support they need from your IT team or are they bringing their own apps? Only 29 percent of employees in the CCS Insight survey get third-party apps through their company but apps like Office are commonly used. When 80 per cent of employees say mobile technology is critical for getting their job done, but the same number say they haven't asked their IT department for the apps they need because they don't think they'd get what they need, that's a sure sign of trouble. It's a sure bet that those employees are downloading apps from public app stores that you may or may not be happy with them using. In fact, says Nick McQuire of CCS Insight (whose recent report shows clear frustrations among employees in the six countries they surveyed), nearly a third of employees say they'd make their own app for business and 10 percent already have. "Basically, employees are doing what they need to," McQuire told us. "They are sophisticated and they are empowered. And they feel the expectations of customers and their colleagues require them to be more responsive and more mobile in general. They are absolutely blending business and personal usage on a daily basis as a result, because IT is not keeping up and is not attentive to their strategic need to be more mobile." 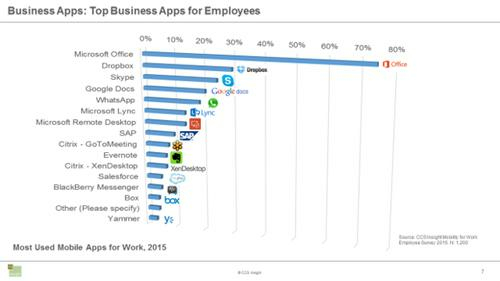 Apps are key to those strategic needs and Microsoft Office is the number one app for employees, ahead of Dropbox, Skype, What's App and Google Docs. "Loyalty to Office is so strong, and employees tell us Office is the most important app they use," McQuire says. "These are the top five apps they deem critical to their business life, and then there's a longer tail of collaboration apps, file editing, sync, communications and chat. Once you've got those deployed and many companies don't have those mobilized then you will satisfy a lot of the mobile needs of the wider array of workers." Again, employees are moving faster than some IT departments, McQuire says. "Employees are telling us they're using apps a lot but our impression is that IT isn't deploying these apps to the extent that employees are using them." In other words, they're installing those apps from public app stores and although they give their IT departments high scores, they're also frustrated with them. "Part of this frustration is around apps. We know employees use apps a lot; we know they're important to how they work. Eighty percent haven't asked IT for an app because 58 percent said they believe the IT department wouldn't act on their request. The common complaints are IT is slow, poor support and weak communications." Despite the high interest in the big-name mobile apps among employees, companies are concentrating on creating their own mobile apps, at least according to what enterprise users told rapid application delivery company OutSystems in its recent app development survey. They agree that mobile-friendly apps and sites matter, and half said that more than half of the new apps they build this year will have a mobile option. But instead of picking up existing apps or cloud services, they're building their own; the top areas are forms and routing for process automation, reporting and analytics, executive dashboards and scorecards, CRM and collaboration. The focus on building their own apps often comes because they need to integrate with existing systems, especially on-site apps and custom, line of business applications (although 79 percent said they also need to integrate with cloud services) and often one app will need to integrate with many of those systems. "Those systems were never designed for this," Andrew Burgess of OutSystems points out. "They were designed before mobile was thought of, and there are security issues." The complexities of mobile development and the lack of mobile development experience in many IT departments are both part of the issues facing enterprise app development. But getting data out of other systems can often be a major reason why IT is slow at delivering custom apps. It can take a week or two just to extract test data for developers to work with, especially if you're masking key fields for security during development because you're using the cloud for devtest. You may be able to speed that up dramatically with middleware like Delphix, which connects to multiple data systems (including SAP, Postgres, SQL Server and MySQL) to speed up database provisioning and data access (to minutes rather than days), but with role-based access controls, data masking policy, version control and change tracking. Their customers often need to access 20 or 30 databases or link ecommerce, CRM, purchasing and marketing systems together to connect apps. Faster access to data doesn't just speed up your initial development and test of applications; it also help with one of the main barriers to creating your own mobile apps being able to keep up with new devices and new releases of mobile operating systems. Dan Weisbeck of mobile testing service Netbiscuits points out that you're going to have to deal with more variations than you expect, even if you're creating Web apps. Their test service adds 250 device profiles a month and currently tests against over 9,000 devices, 430 browser variants and over 130 operating system variants. Even if you don't have to update for compatibility, expect to get requests for changes and new features from users because that's what they're used to in the public app stores they're already downloading from. "Change requests in mobile significantly outstrip change requests for Web app development," Burgess points out. That underlines a significant change in enterprise development attitudes. Back end systems and line of business apps are built to be used for a long time. Web apps for businesses have often been treated the same way, but with mobile apps you have to be more agile about development and updates. If you don't users will just work around the IT department. Delivering apps faster is a challenge, but it doesn't just solve business problems faster. It also gives you more chances to be in a conversation with business teams, points out Andre Pino of PaaS continuous development platform CloudBees. "When you speed up app delivery you also speed up your ability to provide the business with feedback on changes they've asked for," says Pino. "This is what's really going to help IT become a true partner with the business, as the business realizes that they not only can they get an idea implemented in a week instead of months or years, they can also get feedback from IT and figure out what to do instead of making certain assumptions about how the technology will work. And that way you have an opportunity to tie the IT folk more closely together with the business."